ALIENS IN THE PSYCHOLOGY TESTS To the Editor of The New York Times: In an article in THE NEW YORK TIMES of Saturday, Feb. 24, Dr. Charles B. Davenport is reported to have said before the Social Science Institute that "the recent immigration of Russian Jews had been shown by the army psychology tests to stand at the bottom of all European immigrants in respect of native intellectual capacity." I do not know whether Dr. Davenport was misquoted or misinformed, but the facts as reported in the official record of the army psychology tests do not bear out his statements concerning Russian Jewish immigrants. In the interest of fairness and of scientific accuracy, I must take the liberty to correct this statement here. There is no mention in the whole of the voluminous army report of Jews as such. Soldiers were classified only according to nativity, not according to race. So that any conclusion to which Dr. Davenport may come about any group of Jews is pure inference on his part, and cannot in any sense be stamped with the official O. K. of the army report. But since Dr. Davenport refers to Russian Jews I assume he bases his statement on the position, according to the tests, of "Russia" in its relation to England, Italy, Norway, &c., as listed in the army report. Now, although certainly a part of the group designated "Russia" in the army report, is composed of Jews, there is no way of knowing just what per cent. of the total group they constituted, nor how far they influenced the score obtained by that group. Dr. Davenport is not ignorant of the large number of Russians, Lithuanians and Ruthenes who are included in the army group "Russia." Moreover there is some good evidence to show that the Russian Jewish immigrant is, indeed, superior in native intellectual capacity to the non-Jewish Russian immigrant. In the Public Health Bulletin No. 90 for October, 1917, we have a report of "The Mentality of the Arriving Immigrant" by E. H. Mullan, surgeon in the United States Public Health Service. A long series of mental tests, prepared with the help of Professor Woodworth of Columbia University, was given to 293 seemingly normal immigrants of as little schooling as possible. Of these, forty-seven were Russians, forty were Russian Jews. The figures speak for themselves: [basic table] Per cent. (1) Illiteracy: Russians................64 Jews.........................10 (2) Average score: Russians.........77.2 Jews..............83.1 (3) Scores over 90: Russians.........14.9 Jews...............28.5 (4) Highest score.........................96 (Obtained by a Jew) Lowest score..........................50 (Obtained by a Russian) Now, even if it were permissible to judge Russian Jews by scores assigned to the group Russia in the army report, which contains persons of lower intelligence than themselves, Dr. Davenport's statement would still not be true, for the army psychology tests do not place even the group Russia "at the bottom of all European immigrants in respect to native intellectual capacity." Four main series of facts support my statement. First. Of all those who took the army alpha test for literates, the lowest scores (0-9) were received by 2 per cent. more Poles than Russians, and by more than twice as many Italians as Russians. Second. But, of all those who took the army beta test for illiterates the Russians stand second from the bottom (Poles have 1 per cent. more "worst scores"). In view of the fact that Russian Jews have about six times as many literates as non-Jewish Russians (see above) it is reasonable to expect that about six times as many Jews are included in the group Russians who took the alpha test for literates as in the group which took the beta test for illiterates. And the Russians do much better comparatively in the alpha than in the beta. Third. Two groups (Italy and Poland) supplied more "worst grades" than Russia, and four groups (Greece, Italy, Belgium and Poland) supplied fewer "best grades" than Russia. This includes results from all tests. Fourth. And last, even if Dr. Davenport had referred to the combined scores on all tests for all groups, the order of ability places Italy lower than Russia. 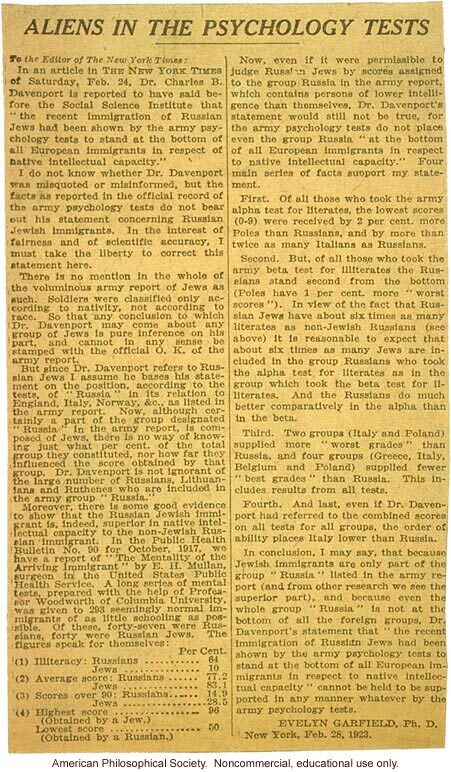 In conclusion, I may say, that because Jewish immigrants are only part of the group "Russia" listed in the army report (and from other research we see the superior part), and because even the whole group "Russia" is not at the bottom of all the foreign groups, Dr. Davenport's statement that "the recent immigration of Russian Jews had been shown by the army psychology tests to stand at the bottom of all European immigrants in respect to native intellectual capacity" cannot be held to be supported in any manner whatever by the army psychology tests. EVELYN GARFIELD, Ph. D. New Yor, Feb. 28, 1923.